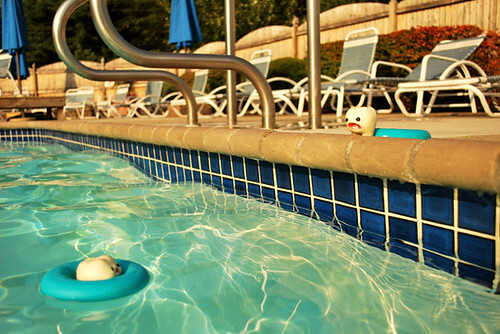 Race you to the pool! Oh man, that looks like 500 feet deep. Lardee, stop hogging the ball. Someone needs to clean this pool. Eh, I suppose I can do it. Hysterical :) Glad to see that he got out of the drain okay! Hahaha! Every time I think you can't possibly think of something else adorable for them to do, you outdo yourself. I guess Lardee got over his water phobia! LOVE the cannonball! SO CUTE!! oh man.. i luv it !!! and ickle so funny !!! :))) i simply adore their lil adventures. makes me smile every time. u r amazing. Haha! Love it! So funny. Your posts always make me giggle - thank you! And amazed at how much effort it must take to put it all together - again thankyou! thanks for making me laugh over my breakfast... 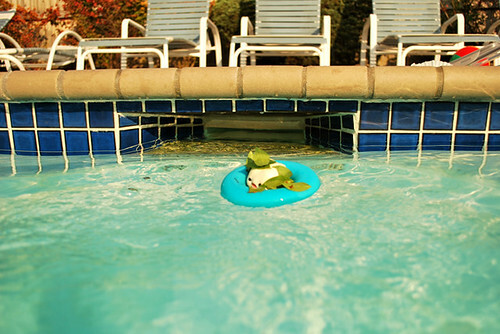 I'd love to be hanging by the pool right now too. Oh I love this one :) the cannonball was cool. how do you even make these shots? Ahh this is just tooo good to be true! Keep up the good work, you make my day everytime! oh, this makes me so happy... can't wait until summer rolls around here again! You have no idea how much these posts make my day! I absolutely adore these guys! Soo cute! And you suprise me in every visit on this site! This is really something! Awww! They are so cute! They look like me when I spend too much time in the sun! How did you ever come up with this idea, I love it! OMG, thank you ever so much for this! Hahaha the last pic is the cutestttt!!!!! Ahh, what sweet! I really LOVE your blog! I cannot stop laughing. So awesome. oh my goodness, this is just too cute! i showed this one to my husband and he just kept on laughing at every frame! cute! love it when they are orange. 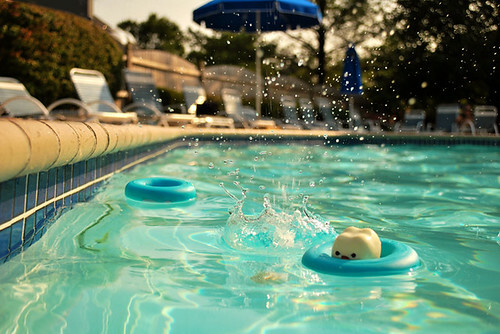 :) i want to splash too. bubbye! LOL that last picture made me literally lol. Still chuckling. Following you has been my wisest blogger decision to date. I never know when I'll have this charming surprise waiting for me - simply splendid. I will be sending you my medical bills becasue I hyperventilated and then my head exploded from the STUPENDOUS cuteness. The toof adventures just keep getting better and better. THANK YOU THANK YOU THANK YOU for posting these. They really do brighten the day! 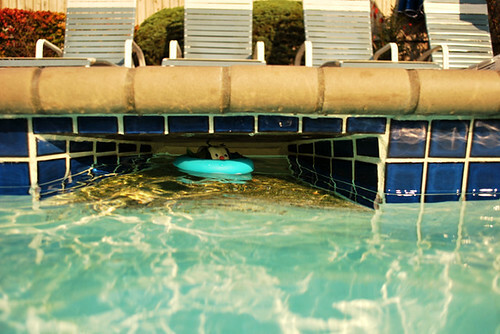 Oh my gosh...for a sec...I thought that was pee in the pool. hilarious! i love the little adventures. you should seriously turn these into a book. Poor toofs! Hope they have aloe when they get home. 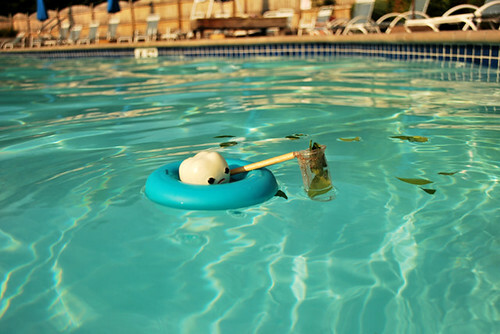 How cute is ickle, cleaning up the pool? I love the water droplets on the "SPLOOSH!!" - SO well-done! Love it! Oh noes! They forgot their sunscreen! These are really lovely! 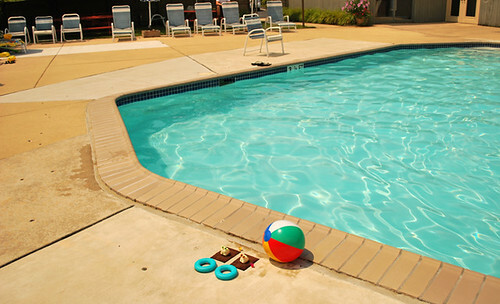 ..but where are all the pool-goers? if i was i big publisher i would ask you to do a book for me or something. haha. LOOOVE your blog! LOL! Love the one where they have the sunglasses on, sunning. Sooooo cute. Every new episode you publish, I use one of the images from it as my desktop background. Inspires many many smiles throughout the day. what a great way to start my morning. Thank you! OMG. this one is very cute! i love this so much! that about sums up my summer! adorable things! Man, that's a big job for ickle, skimming the pool clean. I hope they get some nice aloe gel on those burns. I wonder if Ickle and Lardee will be starting school in the Fall? ha ha, this is fabulous! Love It! i absolutely love your stories. never fail to keep me entertained ( creative plot, great backdrop set & props and adorable leading stars! ), after a day @ work. OMG thank you inhae so much for updating! this made me SOOO happy today! I discovered your page when I came across the links of my buddies. We hail all the way from Malaysia. It's a country in the Asia. My friends and I go bananas over your pieces. Don't stop! WE LOVE ICKLE AND LARDEE. and I feel extra smart waiting by the door for my milk tooth, HAHA. Sooooo adorable. Love the sunburn and the glasses tan lines! The splash shot was perfect. Did it take much time to get it? Oh my. These always make my day!! I love their sunburns, I hope they are okay! Adorable! I don't know how you do this. Amazing! Thanks for updating! I have been waiting all week to see what the little guys have been up to. Your adventures always make me feel so happy and thankful. They have such a beautiful focus on the everyday joys in our lives. Unbelievable cute! Ur milktoof is famous for sure around the world! 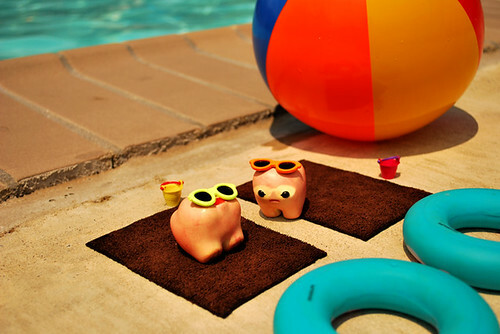 <3 haha i love them, just chillin by the pool :D best blog ever! great work ever! love it! Soooooo cute! I love your blog. It´s true inspirational art. I love this blog, keep the good work. What a beautiful, wonderful, creative idea, WOW! Had so much fun reading from beginning to end, that I'm posting about Ickle & Lardee today. Please keep it up, Inhae, you have a gem here! I'm so glad I was led to your blog by my funny eye. Your sense of humor is awesome. Sunscreen! Do they make sunscreen for toofs? sadly, i look like they do at the pool... despite applying SPF 30 three times... hha. i really don't want to be one of those people who says the same thing as everyone else, but i really do mean it when i say THAT IS SOOOOOOOOOOOO ADORABLE!! 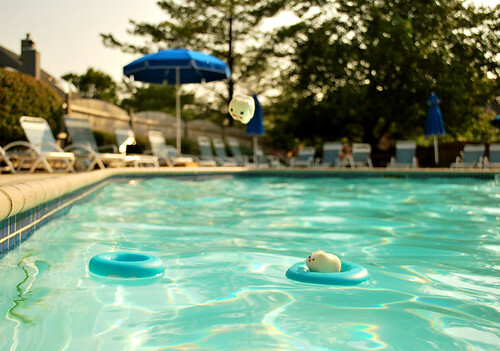 you are an amazing photographer and i especially like the cannonball photo! i want to be a photographer some day so your creativity is very inspiring! What happened to the "I swallowed some water" panel? That cracked me up. Aww poor Ickle and Lardee. 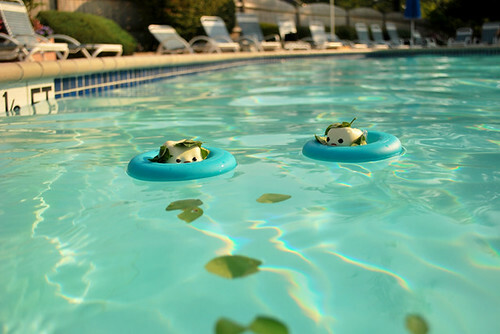 :) I hope you have some aloe for them! Lardee in the drain was adorable. This is amazing. :) I loved the "Cannonball" shot too. That splash was so cute! ohhh my gawd so cute!! 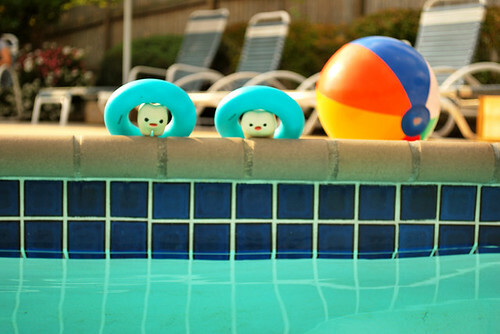 I thought the cannonball rocked, until I saw their little sunburns and tan lines around their eyes. You outdo yourself with every entry! love the cannonball - how did u do it! beta slather dem with aloe for the next few days. Have been missing the silence from Lardee and Ickle. Glad that they updated us.. lovely story. all the way from Malaysia. oh my goodness the teef are having fun in the summer. They are SO ADORABLE. I'm kind of afraid what might happen to them if they get a bit too carried away with their fun! hope they never get a cavity or lose an eye or anything. I really really love this blog! Ickle and Lardee are the cutest ever! Oh my gosh! I discovered your site yesterday and when I checked today I saw this post...tanned teeth...I love it! the cutest ever! I love your stories!!! I love the canonball shot!!! I love it! :) So cute and adorable! Where on earth do you find such darling props? 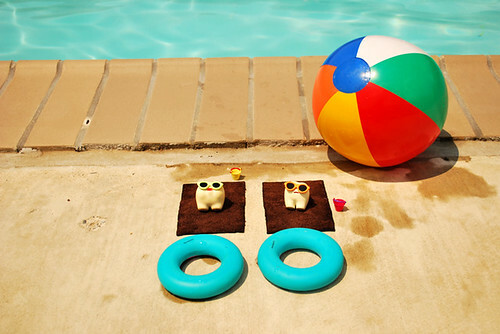 The little pool rings (are those quoits?) just slay me, as do the sunglasses. My favourite photo in this new story is actually the first one - it has such a feeling of expectancy. ickle put his sunglasses on his head to get a closer look at his burnt self. love it. this one is so precious. i love all your entries! they're very cleverly done! Great great work and a wonderful blog. I really BADLY want to know what kind of material Lardee and Ickle are, if you made them by yourself and so on. Please explain to me before i die of curious. Please. With LOTS of LOVE, from a fan . YES!! This is the best thing ever. Thank you for this wonderfully imaginative post. You made my day. eu amo esse blog! parabéns! i was SO SCARED that there was going to be an emergency with the drain! thats why i love your blog so much...it makes me feel and laugh and get all warm and fuzzy! love your creativity! love this blog entry! love everything! im so looking forward to seeing more! HAHAHA very cute, esp. the one where they're using sunglasses! Oh my god, this one is pure genius ! i am so gonna spread this site around! My voice sounds funny in here!!!! Lardee!!!!!! Great (and very funny) ideas & pictures as always ! So cute! This is the best blog ever :) And I've seen lots of blogs. oh man. sad sunburn! i feel your pain toofies. Haha, so cute!! And I often feel like the pool is 500 feet deep too. Probably because I'm practically their height. 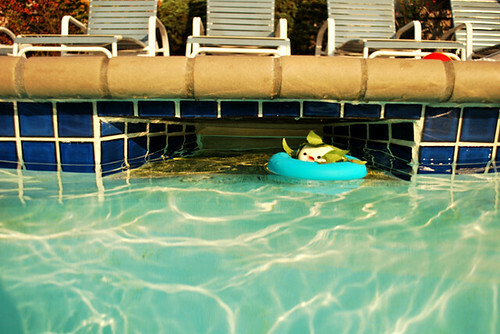 That sunburn shot is classic as well as the cannonball! You make people happy with your blog :o) Arigato~ *HUG! * More please! Wonderful storytelling! I see you live in my old town of Berkeley! I guess it's a city that breeds creativity. I love it- absolutely love it! wat camera do u use if you don't mind me asking :)? i love them! makes me smile every damn time. 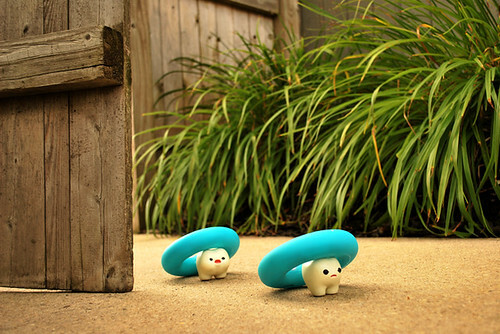 this blog is totally entertaining..
the story is simple yet cute..hahaha. I made the sunbathing frame into a birthday card for my friend! We love this sweet toof world. I love the "cannonball" part and the sunglasses. This blog brightens my day, always! i'm picky about cute things, but the toof adventures is always in my top 3! So Simple, So Beautiful, So Adorable!! Yr milk toof, something I love coming back to - especially when there's bloody lots of assignment and exams and presentations on the horizon! I wrote a recommendation about your blog on my blog recently, and I hope you´ll take a look and comment it. :-) Kiss! Can you help me and sign this, please ? it's hilarious how enamored we all are with these teeth...such a shame. lol. 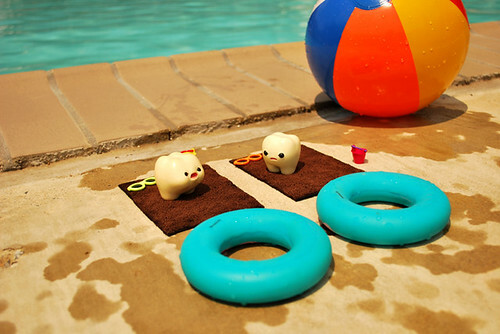 Oh lawds, too adorable for words *eeep* Their little beach toys kill me! where do you get all their beensy little toys?!? 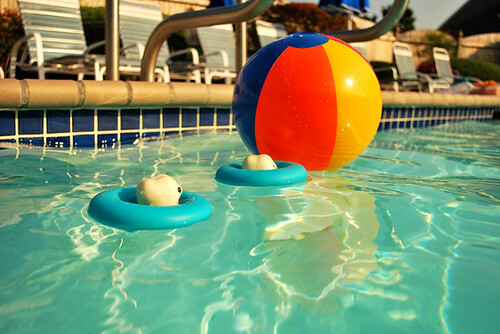 and how cute is the cannonball - that is amazing photography! i was afraid for lardee - good thing he had the floaty ring in the drain! these are absolutely priceless and i am going to beg you to post more often while just loving on the ones you've done so far. brilliant work, really. the idea alone is just crazy good. well done. Any chance of doing a calendar? These are awesome!!!! so cute!! wonderful blog, great pictures and ideas :) congratulations and bye from italy! cuties! wish you would make book(s) with Laurdee and Ickle soon, so I can give my little brother... will you? you are so creative!! please join our artist registry. I would love to have you in our next Newsletter! www.mdartplace.org then go to "for artist" then "msac visual artist registry" Call our office if you have any questions. I have just discovered your blog... and it has made my day!